Speaking during a joint press conference with Japanese Prime Minister Shinzo Abe at the White House Thursday afternoon, President Trump said if the Singapore summit with North Korea goes well, he will invite dictator Kim Jong Un to the United States. 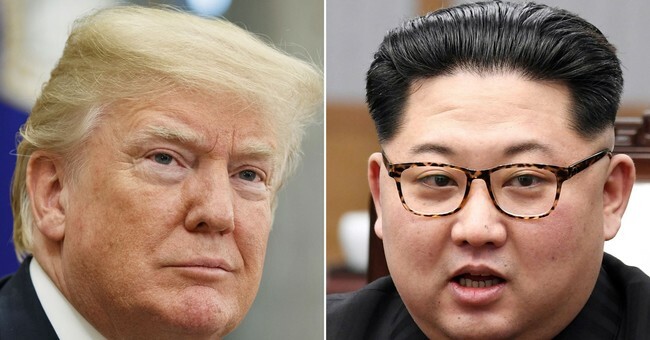 "If the summit does go well, will you be inviting North Korean leader Kim Jong Un to the United States," Daily Caller White House reporter Saagar Enjeti asked in the Rose Garden. "Yes, certainly if it goes well. And I think it will be well-received. I think he would look at it very favorably. I think that could happen," Trump responded, adding Un would be invited to the White House. The president followed up by saying although he hopes the summit goes well, he's still willing to walk away from the table if an ultimate deal isn't in the best interest of the United States. "All I can say is I am totally prepared to walk away. I did it once before. You have to be able to walk away," Trump said. Prime Minister Abe also expressed his support for a successful summit. President Trump ended his remarks by paying respects to the family of Otto Warmbier, the young man who was held hostage by North Korea and returned home in a coma after being tortured. "I want to close by paying my highest respect, regards and love frankly, I've gotten to know then very well, to the Warmbier family. The incredible family of Otto Warmbier who was a brilliant, beautiful, terrific young man. He has not died in vain. I can tell you that. He has not died in vain. To the Warmbier family, our love and our success," Trump said, adding he is grateful to North Korean officials for the recent release of three American hostages. "I believe we are going to a have a terrific success and or a modified success, but in one form or another if it all goes. Things can happen between now and then," Trump continued, turning to the press. "But I know many of you are going and I look forward to seeing you there. I look forward to traveling with you, it's a long way. But I really believe that we have the potential to do something incredible for the world and its my honor to be involved."